An article published in the journal “Nature Astronomy” describes a research that indicates the origin in an anomalous gamma-ray source detected for the first time in 2009 by the NASA’s Fermi gamma-ray space telescope. One of the hypotheses concerned collisions of dark matter particles, instead according to a team of astronomers there are millisecond pulsars in the nucleus of the Milky Way whose emissions mixed up in the signal detected by Fermi. 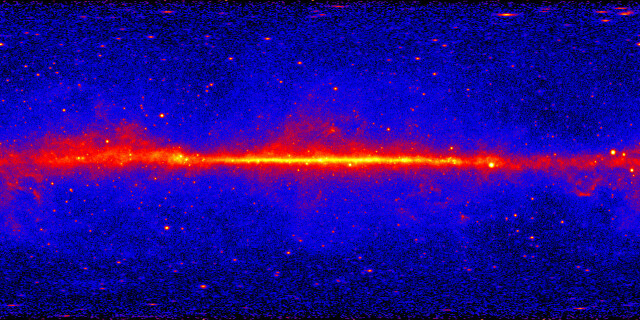 It all started with the creation of a sky map of gamma rays with energy greater than 1 GeV using a survey carried out over the course of 5 years with the Fermi space telescope’s Large Area Telescope instrument. The result was the discovery of an abnormal source at the center of the Milky Way that didn’t match any known gamma-ray source. For this reason, it was simply called a gamma-ray excess by astronomers. One of the goals of the Fermi mission is to look for possible interactions of dark matter, whose existence is for the moment only theoretical but hasn’t yet had any direct evidence confirmed. According to one of the dark matter models, it’s possible that the particles that compose it collide generating electromagnetic emissions that are very energetic, therefore in the form of gamma rays. For this reason, one of the possibilities taken into consideration for the origin of the gamma ray excess at the center of the Milky Way was exactly in a concentration of dark matter particles. According to the supporters of this hypothesis, that concentration causes many interactions and consequently strong emissions of that type. However, in this new research the analysis of the collected data led the authors to conclude that the origin of that gamma ray excess comes from millisecond pulsars. These are neutron stars, the remains of ancient stars exploded in the past that collapsed into spheres of about ten kilometers in diameter. These spheres spin at speeds that depend on various factors: in the case of millisecond pulsars they spin thousands of times per second. The researchers created models to simulate the possible situations at the center of the Milky Way and the result is that the presence of millisecond pulsars better describes the gamma ray excess than the interactions of dark matter. There’s an abundance of stars, both at the height of their life and dead and therefore also in the form of neutron stars, in that area, what in jargon is called the bulge. This means that there may be many millisecond pulsars whose signals get mixed up resulting in the gamma ray excess. This research was based on theoretical models, not on direct observations of the Milky Way nucleus. A considerable amount of interstellar dust prevents us from studying it at many electromagnetic frequencies so we need telescopes such as Fermi, which can detect gamma rays, and radio telescopes, which can detect radio waves, to study it. These are the instrument the researchers will use to try to understand if those pulsars really exist.